The Amish Hickory Wood Bar Table contributes to a rustic furniture collection. Looking natural and rugged, the table legs represent the authentic beauty of the outdoors. Hickory wood and oak wood combine to create a bar table that exudes warmth and invitation. Hickory wood offers a textured, rough surface to reveal its natural beauty, while oak furniture is known to create a cozy atmosphere in any room. Gather for dinner, snacks, drinks and fun with this bar table contributing to your rustic decor. 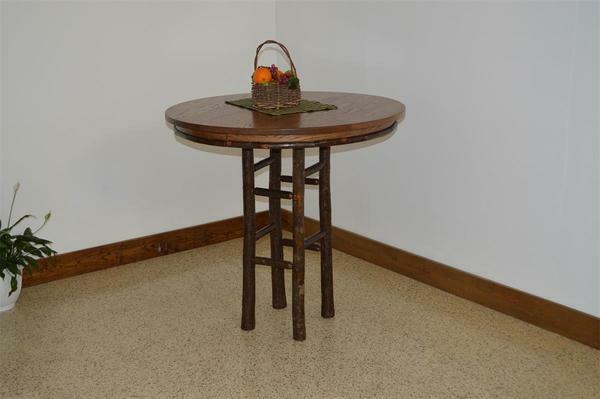 Perfect for a lodge or log cabin style furniture collection, this solid wood bar table is made with the utmost care by skilled Amish craftsmen. View more rustic furniture selections for other areas of your home. Match the Amish Hickory Panel Back Bar Chair with this wood table for an outstanding set you can enjoy using. Amish made furniture means heirloom quality. Invest in the best handcrafted furniture that can be passed on throughout the family for years to come. We are interested in creating the custom furniture you are looking for. Contact our devoted team of Amish Furniture Specialists with any questions, toll-free at 866-272-6773. DutchCrafters Is rated A+ by the Better Business Bureau, as we make customer service and satisfaction our number one priority.